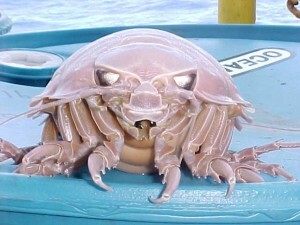 Giant Isopods of the genus Bathynomus have been known to science since the late 1800’s, but the discovery of a particularly large specimen (2-1/2 feet long) by the Sub-sea Survey Company has sparked the public’s fascination with these pallid pink deep sea “monsters.” Giant Isopods commonly grow up to about a foot long and weigh a little over 3-1/2 pounds. Giant Isopods are crustaceans related to familiar “pill-bugs,” terrestrial Isopods commonly found in our gardens. They live in cold, deep waters of the Atlantic and Pacific oceans where they scavenge whale carcasses and prey on squid, fish, and other crustaceans. 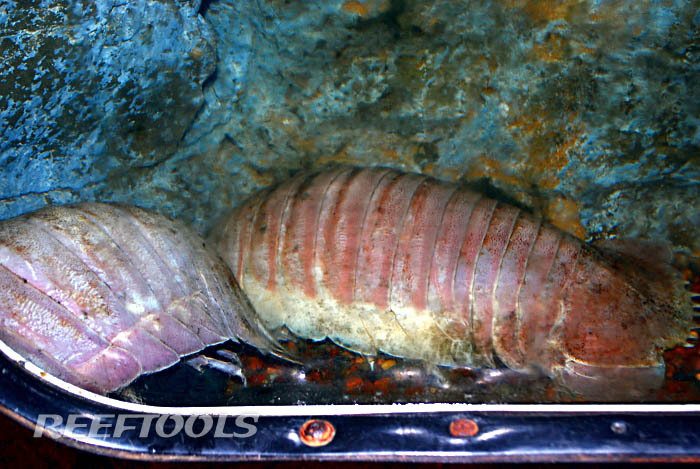 You can see Giant Isopods like the ones pictured above in person at the Shedd aquarium in Chicago, Illinois.